Be the first to share your favorite memory, photo or story of Rafael. This memorial page is dedicated for family, friends and future generations to celebrate the life of their loved one. 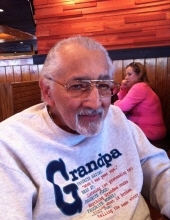 Rafael Daniel Nieves, 88, widower of Darleen Elizabeth Burns Nieves, passed away Thursday, November 29, 2018 in Lexington, Kentucky. Born on December 11, 1929 in San Juan, Puerto Rico, he was the son of the late Jose Adrisio Ramos and Oliva Suarez Nieves. Rafael was a Veteran of the United States Air Force. Rafael is survived by son, Arturo Nieves of Quantico, Virginia, and daughters, Rita Nieves of Lexington, Kentucky, Christina Nieves of Fort Mills, SC, and Monica Nieves of Lexington, Kentucky, grandchildren, Amanda, Morgan, Danielle, Dara, Gabriel, and Anna, and 3 great grandchildren. Visitation will be 5pm-7pm, Tuesday, December 4, 2018, at Tucker, Yocum, & Wilson Funeral Home. Service will be Wednesday, December 5, 2018 at 11am at the funeral home with Father Linh Nguyen officiating. Burial will be in Kentucky Veteran North Cemetery with military honors. To send flowers or a remembrance gift to the family of Rafael Daniel Nieves, please visit our Tribute Store. "Email Address" would like to share the life celebration of Rafael Daniel Nieves. Click on the "link" to go to share a favorite memory or leave a condolence message for the family.